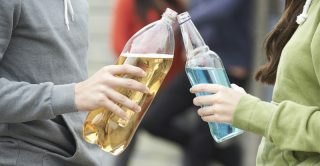 The arteries of teenagers who drink alcohol and smoke, even very occasionally, are already beginning to stiffen by age 17, according to UCL research that draws on data from the Children of the 90s study. Arterial stiffness indicates damage to the blood vessels, which predicts heart and blood vessel problems in later life, such as heart attacks and stroke. Teenagers in the ‘high’ intensity smoking group had a relative increase of 3.7 per cent in the stiffening of their arteries (measured by mean increase in pulse wave velocity) compared to those in the ‘low’ smoking intensity group. Teenagers showed a preference for beer over wine or spirits, and those who tended to ‘binge drink’ (have more than 10 drinks in a typical drinking day, with the aim of becoming drunk), had a relative increase of 4.7 per cent in the stiffening of their arteries compared to ‘light’ intensity drinkers. Participants in the ‘high smoking and ‘high’ drinking intensity group had a relative increase of 10.8 per cent in the stiffening of their arteries compared to those who had never smoked and low alcohol consumers. The research was funded by The UK Medical Research Council (MRC), British Heart Foundation (BHF), Wellcome and the University of Bristol who provide core support for the ALSPAC. ‘Early vascular damage from smoking and alcohol in teenage years: the ALSPAC study‘ by Marietta Charakida et al. Published in the European Heart Journal.